While Muslims are found on all five inhabited continents, more than 60% of the global Muslim population is in Asia and about 20% is in the Middle East and North Africa. However, the Middle East-North Africa region has the highest percentage of Muslim-majority countries. Indeed, more than half of the 20 countries and territories1 in that region have populations that are approximately 95% Muslim or greater. More than 300 million Muslims, or one-fifth of the world’s Muslim population, live in countries where Islam is not the majority religion. These minority Muslim populations are often quite large. India, for example, has the third-largest population of Muslims worldwide. China has more Muslims than Syria, while Russia is home to more Muslims than Jordan and Libya combined. 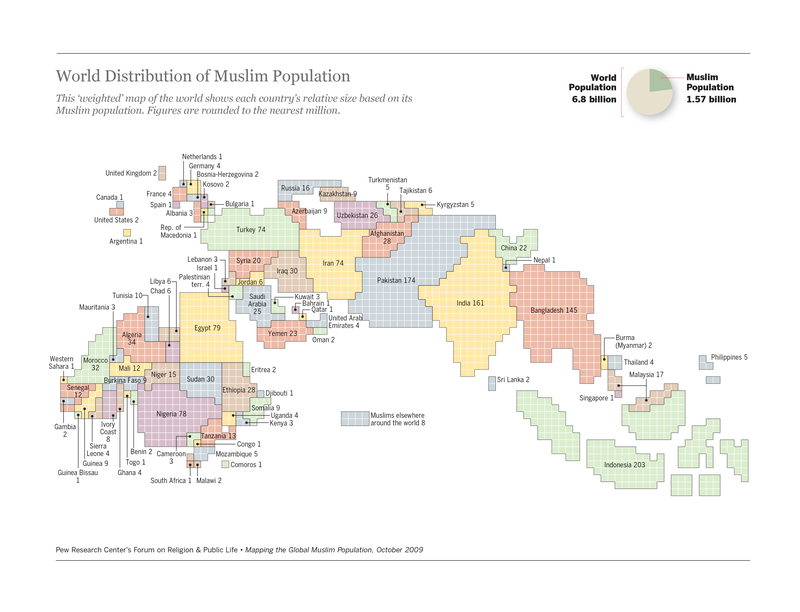 These are some of the key findings of Mapping the Global Muslim Population: A Report on the Size and Distribution of the World’s Muslim Population, a new study by the Pew Research Center’s Forum on Religion & Public Life. The report offers the most up-to-date and fully sourced estimates of the size and distribution of the worldwide Muslim population, including sectarian identity. Previously published estimates of the size of the global Muslim population have ranged widely, from 1 billion to 1.8 billion.2 But these commonly quoted estimates often have appeared without citations to specific sources or explanations of how the figures were generated. The Pew Forum’s estimate of the Shia population (10-13%) is in keeping with previous estimates, which generally have been in the range of 10-15%. Some previous estimates, however, have placed the number of Shias at nearly 20% of the world’s Muslim population.3 Readers should bear in mind that the figures given in this report for the Sunni and Shia populations are less precise than the figures for the overall Muslim population. Data on sectarian affiliation have been infrequently collected or, in many countries, not collected at all. Therefore, the Sunni and Shia numbers reported here are expressed as broad ranges and should be treated as approximate. These findings on the world Muslim population lay the foundation for a forthcoming study by the Pew Forum, scheduled to be released in 2010, that will estimate growth rates among Muslim populations worldwide and project Muslim populations into the future. The Pew Forum plans to launch a similar study of global Christianity in 2010 as well. The Pew Forum also plans to conduct in-depth public opinion surveys on the intersection of religion and public life around the world, starting with a 19-country survey of sub-Saharan Africa scheduled to be released later this year. These forthcoming studies are part of a larger effort – the Global Religious Futures Project, jointly funded by The Pew Charitable Trusts and the John Templeton Foundation – that aims to increase people’s understanding of religion around the world. 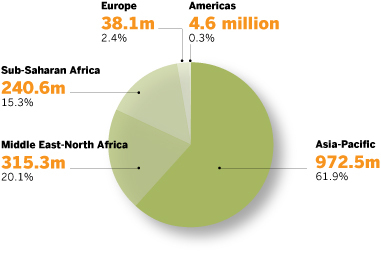 2009 Muslim population, the percentage of its population that is Muslim and the percentage of the world Muslim population it represents. * Indicates the use of a source with a small enough sample size to make these estimates somewhat less reliable. Due to this greater margin of error, percentages are rounded to the nearest integer rather than to the first decimal place and are therefore more approximate (~). The only exception to this rule is the display of Turkey’s percentage of world population as 4.7% rather than ~ 5%. “–” indicates that the number of Muslims is too small to be reliably estimated. This “weighted” map of the world shows each country’s relative size based on its Muslim population. Figures are rounded to the nearest million. Click to enlarge. Two-thirds of all Muslims worldwide live in the 10 countries shown below. Of the 10 countries, six are in Asia (Indonesia, Pakistan, India, Bangladesh, Iran and Turkey), three are in North Africa (Egypt, Algeria and Morocco) and one is in Sub-Saharan Africa (Nigeria). * Data for Turkey and Morocco come primarily from general population surveys, which are less reliable than censuses or large-scale demographic and health surveys for estimating minority-majority ratios (see Methodology). As a result, the percentage of the population that is Muslim in these two countries is rounded to the nearest integer. While 80% of the world’s Muslims live in countries where Muslims are in the majority, significant numbers – about one-fifth of the world’s Muslim population – live as religious minorities in their home countries. Of the roughly 317 million Muslims living as minorities, about 240 million – about three-quarters – live in five countries: India (161 million), Ethiopia (28 million), China (22 million), Russia (16 million) and Tanzania (13 million). Two of the 10 countries with the largest number of Muslims living as minorities are in Europe: Russia (16 million) and Germany (4 million). * Data for Germany come in part from general population surveys, which are less reliable than censuses or large-scale demographic and health surveys for estimating minority-majority ratios (see Methodology). As a result, the percentage of the population that is Muslim in Germany is rounded to the nearest integer. Of the 232 countries and territories included in this study, 50 are Muslim-majority. Out of these, however, more than six-in-ten (62%) have a smaller Muslim population than do Russia and China individually. The Middle East-North Africa region contains the highest percentage of Muslim-majority countries compared with other regions. Of the 20 countries and territories in the region, 17 have a population that is more than 75% Muslim, with Israel, Lebanon and Sudan being the only exceptions. In comparison, only 12 of 61 countries in Asia, 10 of 50 countries in Sub-Saharan Africa and two of 50 countries in Europe (Kosovo and Albania) are 75% or more Muslim. An overwhelming majority of Muslims are Sunnis, while an estimated 10-13% are Shias. This report estimates that there are between 154 million and 200 million Shia Muslims in the world today. Between 116 million and 147 million Shias live in Asia, representing about three-quarters of the world’s Shia population (note that Iran is included in the Asia-Pacific region). Meanwhile, nearly a quarter of the world’s Shias (36 million to 44 million) live in the Middle East-North Africa.4 Looked at in a different way, 12-15% of the Muslim population in the Asia-Pacific region is Shia, as is 11-14% of the Muslim population in the Middle East-North Africa region. The figures for Shias are generally given as a range because of the limitations in the secondary-source data (see Methodology for Sunni-Shia Estimates). Sunni Muslims and Shia Muslims (also known as Shiites) comprise the two main sects within Islam. Sunni and Shia identities first formed around a dispute over leadership succession soon after the death of the Prophet Muhammad in 632 A.D. Over time, however, the political divide between the two groups broadened to include theological distinctions and differences in religious practices as well.While the two sects are similar in many ways, they differ over conceptions of religious authority and interpretation as well as the role of the Prophet Muhammad’s descendants, for example.For readers seeking more detail on the categories used in this report, Sunnis include followers of the Hanafi, Shafi, Maliki and Hanbali schools of Islamic jurisprudence as well as the Wahhabi or Salafi movement. Shias include Ithna Asharis (Twelvers), Ismailis, Zaydis, Alevis and Alawites. There also are a few Muslim groups that are difficult to classify as either Sunni or Shia. These include Kharijites in Oman and the Nation of Islam movement in the United States, as well as the Druze, who are located primarily in and around Lebanon. Given the relatively small numbers of people associated with such groups, this report does not provide separate figures for them, but they are included in the overall Muslim population statistics. Readers should also note that there is no separate estimate for Sufis, whose spiritual and mystical practices have a following among both Sunnis and Shias. There are no reliable figures on the proportion of Muslims worldwide who follow Sufi practices. In four countries – Iran, Azerbaijan, Bahrain and Iraq – Shia Muslims make up a majority of the total population. Roll over a country bubble to see the percentage of its Muslim population that is Shia and the percentage of the world Shia population it represents. Note: Countries with an estimated Shia population of less than 1% of the country’s Muslim population are not listed. The figures for Shias are generally given in a range because of the limitations of the secondary-source data (see Methodology for Sunni-Shia Estimates). Figures may not sum to totals due to rounding. 1 For a definition of “territories,” see the methodology. 2 See, for example, CIA World Factbook; Foreign Policy magazine, May 2007; Who Speaks for Islam: What a Billion Muslims Really Think, 2008; Adherents.com; and IslamicPopulation.com. 3 See, for example, IslamicWeb.com; “Shia Muslims in the Middle East,” Council on Foreign Relations, June 2006; and “The Revival of Shia Islam,” Vali Nasr speaking at a Pew Forum event, July 2006. 4 The three-quarters figure for Asia was calculated by comparing the middle of the range of the estimates for Asia’s Shia population (about 132 million) with the middle of the range of the estimates for the world’s Shia population (about 177 million). The figure for the Middle East-North Africa was calculated by comparing the middle of the range of the estimates for the Middle East-North Africa’s Shia population (about 40 million) with the middle of the range of the estimates for the world’s Shia population (about 177 million).